Now, there are some iPhone games pretty much everyone out there has on their handset: Angry Birds, Cut the Rope, Fruit Ninja, Flight Control and Plants vs Zombies. Even if you don’t have them, you’ve heard about them, but have you played them in real life? 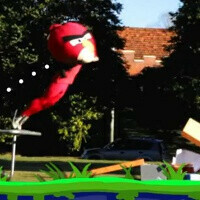 This is probably the most hilarious attempt of bringing the most popular iPhone titles to life with real Angry People jumping on trampolines dressed as birds, wearing a flower costume and defending against zombies, and if that wasn’t amusing enough it’s all spiced up with a seriously catchy indie tune. Oh, and there’s a real Flight Control girl! One last warning before you start watching - don’t try this at home. Seriously, it could hurt. You’ve been warned, so feel free to proceed to the video below for a good start of the week. First. Must not be a people person.